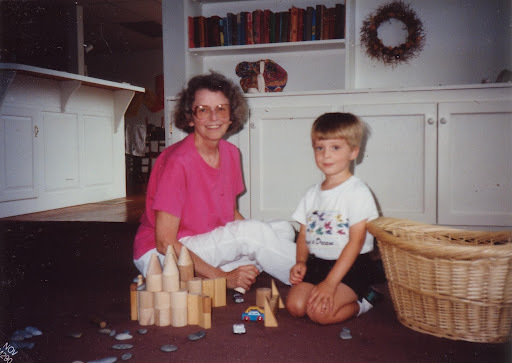 Edward, 4, with my mother. He was a nice boy, really. “He is?” I was surprised. Edward was 2 years old. It became pretty clear that the babysitter blamed me. I wanted to shift it to his father, but of course I didn’t do that in front of her. I knew *I* never used those words the wrong way. (Never, never, never.) I wracked my brain. Where might he have heard it? He clearly knew better than to say it in front of me, and that was mysterious. How did he both know it and know when not to say it? Furthermore, I was embarrassed. I wonder what that young lady thought of us? Did she wonder if we were really “good” Christians? I talked to Edward about it, found a new babysitter and hoped my rep as a Christian would be less damaged in the future. What does it mean to us? Does it mean worshiping a certain way, or sending your kids to religious school? Does it mean never saying the right words the wrong way? At that time, I thought it meant me. I was in my mid-20s, and a lot of what I thought mattered about being Christian was external. I never missed church, and I made sure the whole family came along. I volunteered and willingly took on terrible jobs, like recruiting Sunday School teachers from a long list of people I’d never even met. I knew giving money was important, and I suffered over having virtually no income to commit to the church myself. I gave my energy, though, and my time. I loved it, and I felt good about it, and it made me feel good about myself. But it was mostly on the outside. And I believed – I almost hate to admit this now, but it’s true – I believed that if I did all those things thoroughly and willingly, everything in my life would go well. And I wasn’t experienced enough or observant enough to figure out that life, even for a faithful Christian, is more complicated than that. Ooh, politics. Get thee behind me, Satan! I am tempted to go down the road of talking about birth control and stereotypes and what I think Jesus would think…and that might get me into hot water. We don’t like politics in church, even if we write down on paper that the preacher has the freedom of the pulpit. We’d just as soon not hear it. That’s just the trouble, though, isn’t it? Jesus got mad at Peter because Peter wanted Jesus to shut up about getting in political trouble with the religious authorities and being killed because of it, and Peter especially wanted Jesus to stop that crazy talk about being raised from the dead. Because that was news to him. Disturbing, bad-sounding news. Get behind me, Satan. Stop distracting me from what really matters. If someone calls me a Christian, I’m not sure if they’re naming me or calling me a name. The same name that sounds wonderful to me may sound awful to someone else, an example of oppression or inhospitality or snobbery or judgment. Ever tell someone you’re a Christian and have them take a big step back? It happens to pastors all the time. What does it mean to be a Christ-follower, to you? To the world now? To the people around Jesus? You’ve heard me say I struggle with the seemingly universal view of Christians as conservative evangelicals who are – at the moment – anti-contraception and anti-gay and anti-equality. That doesn’t describe most of the Christians I know. Unfortunately some of the very Christians whose ideas inform that public perception would call me – and yes, you – not “real” Christians. Having me, a woman, stand up here and preach, would be reason enough for some of them to say we are not truly faithful. Christians are the people who aren’t afraid to talk about what really matters. And for Christians what really matters is – I have to stop right there. What really matters is not the same for all Christians. I’ve driven by churches with signs that say, “We preach Christ crucified.” “We preach Christ crucified.” It’s part of a verse from Paul’s 1st letter to the Corinthians. Somehow that emphasis on the cross is powerful for many Christians. It points to the sinfulness of humanity – our total depravity – not something Congregationalists tend to focus on very often, but we have a Presbyterian here today, and I want her to know I’ve given this some thought. It points to our sin. And whether you think we’re born that way or just get that way, it’s true that we are inclined toward sin. We want to distract ourselves … and even God! …from paying attention to ultimate matters. This had to sting for Peter. He did NOT understand. Surely, surely this man who could calm storms and feed multitudes and heal blind people and lepers and lift up Peter’s own mother-in-law from her death bed, so that she could fix dinner, surely he could figure out some way to avoid suffering and rejection and death! Jesus said it to the one who tempted him to avoid all that. Quickly, though, he spoke with vehemence. He REBUKED Peter, a word that sounds just like the slap across the face it is. It’s an outraged NO!!! Not this again!!! I will not have it! It’s tempting to focus on the crucifixion. After all, Jesus says we need to carry our crosses if we want to follow him, and he doesn’t mean wear a necklace. He means be prepared to suffer, to be humiliated, to lose everything you have and everything you ever wanted. Be clear. It’s rigorous, a lot more rigorous than the busy schedule I set for myself as a young mom who volunteered at church. Christians are the people who remember God is with them when the path leads up the side of a hill to a place where everything important feels exposed and endangered. But that’s not the end of the story. We know there’s more. 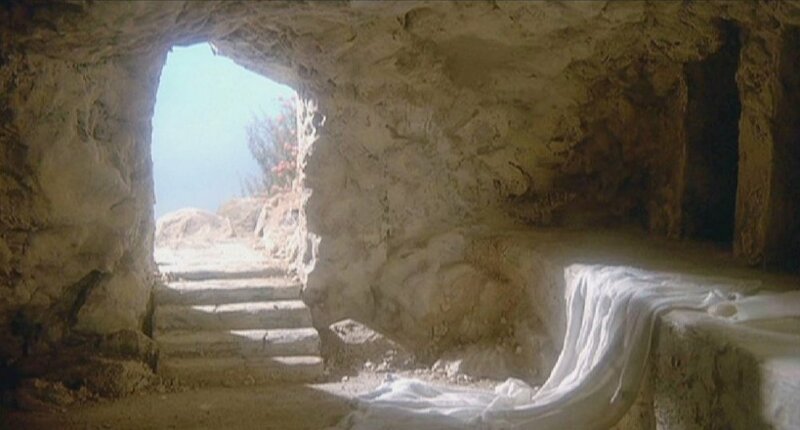 Here’s who I call Christian: the people who focus on Christ resurrected. And in that rising is our connection to the past and our hope for the future. Death is not the end. Evil cannot defeat the God of Love. These are the things that matter to Christians. Who you calling Christian? I hope all of us. In the name of the one who suffered and died and in three days rose again. Amen. I like this a lot. If I were resonating more with this, I'd shatter like a glass in the presence of Ella Fitzgerald's voice (live or on Memorex tape). Thanks, Martha, for your inspiring words. I love your optimistic perspective. I've always wondered how we can truly lift each other up in the way that God must surely intend us to do if we focus on sin, blood and penance. It's so much easier to urge each other forward in the light of hope and love. For 33 years–first in person and now online–you have kept my brain sharp with your insightful wisdom. Don't ever stop!